"Syrup for use on pancakes. You can store the syrup in the refrigerator if you intend to use it quickly. 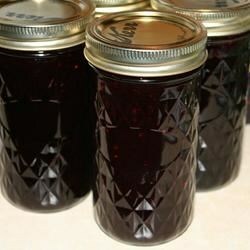 To preserve for a longer time, sterilize the jars, pour into the canning jars to within 1/4 inch of lid, adjust lids and process in boiling water canner for 10 minutes." Mix the blackberry juice and sugar, bring to a boil. Boil rapidly for 2 minutes. Skim off foam. Pour into HOT sterile jars or bottles. This makes a thin syrup (like true maple syrup). If you want it slightly thicker, you can add a small amount of powdered pectin (less than half a 2 ounce box) to the cold syrup and sugar mixture. A cakey, berry-full easy dessert! Yummy! And fast. I added a tablespoon of pectin to make it a little thicker. I added sugar free blackberry jello to thicken it. Absolutely Terrific! I have also made this using half strawberries and half blackberries. Superb!